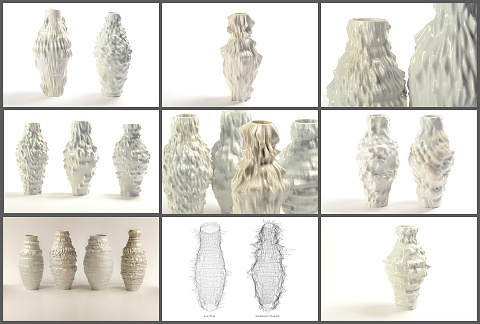 SOUND SURFACE SERIES - With these pots a point is coded in virtual space to spiral, and as it grows into the pot shape a three dimensional computer mesh is created linking the points. The surface of the mesh is progressively textured by adding digital sound recording to the growing form. The surface, from base to rim becomes a representation of the tone and rhythm of the music named in the title of the pot. In the ‘Sound surface - Benjamin Britten 4 Sea Interludes from Peter Grimes’ I have used one prescribed virtual vase shape, so each forms starts the same. The length of the musical interlude then defines the height of the vase - each sea interlude is around 4 minutes but are slightly different and that is now reflected in the vase height. Then also by keeping the forming code for the underlying shape the same the effect of the sound on the surface is more comparable. 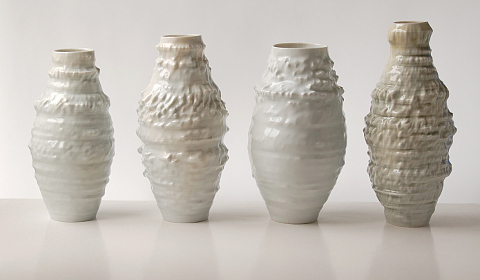 The difference of the rhythm and volume of each interlude changes the texture and basic shape to each vase and can be clearly seen.